The Apprenticeship Programme application process is designed to be as straight forward, accessible and supportive as possible. We want to ensure that you have the best opportunity to impress. Our main aim is to identify the best talent for our growing Retailer Network. Please take some time to review the live vacancies including job descriptions and all of the resources that can be found on the site. You’ll also find a short video (above) that will walk you through each step of the recruitment process. Remember, we’re here to help. If you have a question, don’t be afraid to get in touch. We’d love to hear from you. Whatever the outcome, feedback is available at every step. We welcome applications from everyone irrespective of gender or ethnic group and appointment will be based on merit alone. Being committed to equal opportunities, if you have a disability please state this during the application process. Measures will be put in place to support you through your application and apprenticeship journey. To start the application process or to register for our Candidate Pool, applicants should navigate to the Apply Now button located on the website. You will be asked to complete a simple application form. We will ask for some key information about you including prior attainment, any relevant experience that you possess and your interests. We'll ask you to tell us why you're applying and why you think you’d be a great apprentice. Remember; take your time, check the accuracy of the information that you share, sell yourself and make it clear exactly why you’d like to join the apprenticeship programme. Finally, don't be afraid to get help with your application. Ask a parent/guardian or tutor for example to check your application before you finally submit. If your application meets the basic selection and eligibility criteria outlined, you will automatically be asked to complete 4 online assessments in Maths, English, ICT and Mechanical Comprehension. Be sure to complete the assessments in a suitable environment where you won't be disturbed. You can pause the assessments at any time and return to them with your unique login details. Remember to read all of the on screen instructions and take a note of the pass marks. All candidates will be updated on the progress of their application within 48 hours of submitting an application form. So make sure that you check your emails and phone regularly. We’re committed to providing feedback at each step of the way. In the event that candidates are unsuccessful we aim to provide personalised feedback specific to your application. Successful applicants will be invited to participate in a brief telephone interview with one of the team. This is a great opportunity for us to get to know you better and for you to understand more about the programme. Detailed candidate guidance on this step can be located on the website under the ‘Information, Advice and Guidance’ tab. After a successful telephone interview you will be invited to attend a formal interview at your local Jaguar Land Rover Retailer. Once again, we're on hand at every stage and support all candidates in their preparation with helpful advice and guidance and we'll make sure that you have all of the information that you need in advance of the interview. 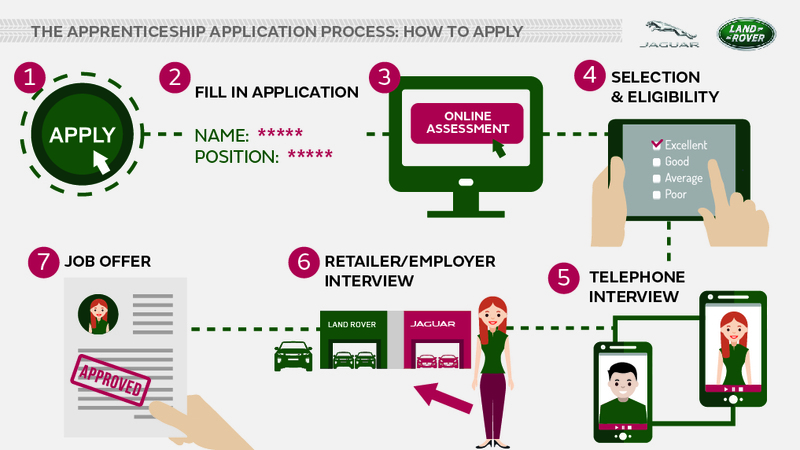 The successful candidate will be offered a job opportunity by their local Jaguar Land Rover Retailer and will in turn be enrolled onto the Apprenticeship Programme. Learners will commence their apprenticeship soon after. New groups start with the programme all year round. If you'd like to discuss the programme and the application process in greater detail, please call the team or send us an email. We would be delighted to hear from you. Remember, there are lots of resources on the website that will support you with your application. If you think that you have the passion, desire and ambition to work for a prestigious brand and want to pursue an exciting career in the automotive industry then please apply.